Green Attachments cutter crusher Yellow C range has been created for the most demanding and precise primary demolition applications. Yellow C cutter crushers are suitable for the demolition of reinforced concrete structures and the high rise building demolition, mounted on long reach demolition booms. The product has a robust structure and powerful and efficient productivity. The geometry makes sure that maximum power is reached just in the right moment and two cylinder kinematics allows very high power also in the end of the movement when high cutting force is needed. Robust structure of cutter crushers with fast and powerful performance allows efficient demolition, the most typical are reinforced concrete structures. There are cutting blades in order to cut reinforcements. Yellow RS cutter crusher design has been made according to customer’s needs to acquire light and durable structure combined with high power and efficienfy. Cutter crusher are designed with flange which allows the customer to change adapter easily. Green Attachments provides different adapters when needed. The Yellow C cutter crusher range consists of twelve models for 1.5 - 130 tonne excavators (3 300 – 290 000 lb). - Yellow C cutter crushers have a high speed valve to increase performance. Then oil is rotated from rod side to piston side regeneratively, all products has not that feature. - Cutter crushers have changeable steel bushings and they have been over sized in order to increase life time. 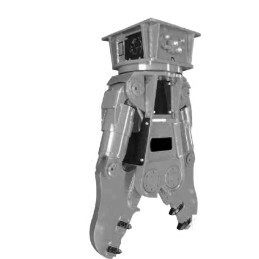 - Hydraulic rotation makes positioning of cutter crushes easy. Durable orbital hydraulic motors have a gear in order to maximise power and productivity. - Cutter crushers have well designed hydraulics to minimize overheating. - Cutter crushers have maintenance free SAE fittings in order to minimize leaks and problems.